My own take on the classic audio effect. 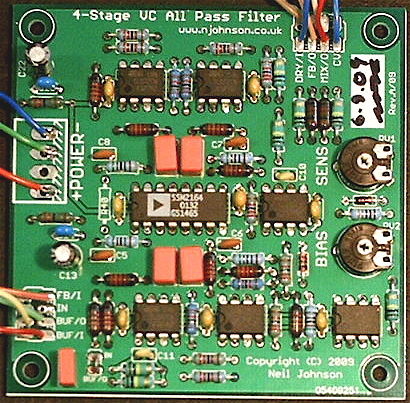 Again, using the SSM2164 quad VCA to provide four stages of phase shift. 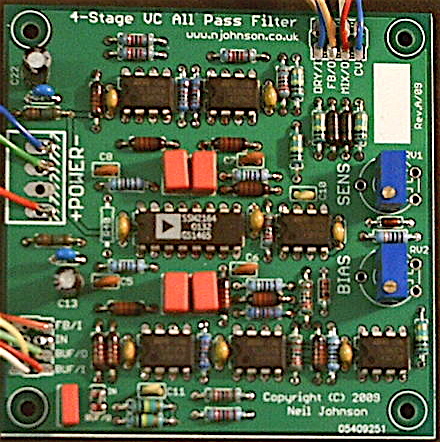 This module is very much designed as a building block, with the input buffer, the filter, and the output mixer treated as separate blocks, with only minimal connections between them. Ideal if you want to chain multiple VCAPFs together to build a monster multi-channel many-stage phaser. It turns out that this circuit toplogy had previously been proposed by Hoshuyama in 2004. In that circuit Hoshuyama proposes a 2-pole circuit comprising a combined feedforward/feedback combination, whereas the idea presented here comprises a series of 1-pole VCAPF sections cascaded. One thing to note is the relationship between poles (or stages) and notches. For n poles there will be n/2 notches, so a 4-pole APF will produce 2 notches. It can also be used as a standalone phaser with the addition of a couple of 10k pots. The audio samples below are all produced by a single VCAPF in this way. This module is ideal for controlling with my VCLFO, providing slowly sweeping phaser effects across two or three audio channels. Here are some samples made with the VCAPF acting as a mono 4-stage phaser controlled by my VCLFO. No credit is claimed for artistic merit or performance abilities! File sizes are approximate. Note also that these recordings have been through a lot to get here - recorded into a minidisc recorder (ATRAC compression) then turned into an MP3 (yet more compression). All were recorded with maximum effect and about 20% feedback. The traditional white noise phaser test. Source: Jen SX1000. MP3, 290kB. Strings through a phaser. How ... French. Source: Emu ESI32. MP3, 700kB. A plucky stab-y sound. Source: Emu ESI32. MP3, 530kB. An all-pass filter gives you true pitch-shifted vibrato. Source: Emu ESI32. MP3, 270kB. A simple drum pattern sounds more alive. Source: Emu ESI32. MP3, 265kB. Please note that all these documents are Copyright © 2009 Neil Johnson. BUF/I and BUF/O are for the input buffer's input and output respectively. IN is the main input, FB/I is the feedback input. DRY/I is the dry input to the output mixer. FB/O is the tapped output of the last filter stage suitable for feeding back to FB/I. MIX/O is the main mixed output. CV is the control voltage input. The white area near the trimmers is for you to mark the board with some identifier (I usually write the date of completion). I have specified polypropylene capacitors for the phase shifters. You can also use polystyrene capacitors if you have them available. Components marked 'DNF' are Do Not Fit - I put them in for experimentation (I find it easier to not fit a component rather than to bodge it on later if I change my mind). The only special component is the SSM2164P (DIL package version). This is available both from Magic Smoke (they sell the CoolAudio clone V2164), Farnell and Digikey.